Sunrise, FL – A mostly quiet and uneventful night at the BB&T Center, unless you’re an Islanders fan. Sunrise looked and felt more like Long Island South tonight as another large plethora of New Yorkers invaded the home of the Panthers and left with a 2-1 shootout win. Invasion week actually began earlier this week at the Marlins vs. Mets series when the whole first base side of Marlins Park would erupt in cheers and constant deafening “Let’s Go Mets” chants. As a Miami sports fan, it honestly makes me mad that I’ve become used to it already. I’ve seen it at Dolphins and Heat games as well. Tonight was just a continuation. Game 81 of the Panthers season played out like a carbon copy of this season. A slow start, an early deficit, a late surge and an all too familiar feeling of victory slipping through our grasps. The Isles carried the flow and tempo of the game early on. Taking the lead early in the second period and would hold that lead until Jonathan Huberdeau scored the tying goal for the Panthers with 7:15 left in the third period. The Cats finally showed some life after the Huby goal but were not able to light the lamp the rest of the game. Including missing all four shots in the shootout. Last season, Huberdeau had his best season with 27 goals and 42 assists. With one game left on the season, he currently holds the Panthers single-season record for assists with 61 so far. Aleksander Barkov is right behind him with 60. With his goal tonight, Huby now brings his season point total to 90, also a new career high. Sam Montembeault really shined tonight, making 35 saves in his 10th NHL start. The kid is really showing some promise and if he adds a few pounds of muscle then his upside will be even greater. “He (Montembeault) played amazing. He gave us a chance,” Panthers coach Bob Boughner said.” He held us in there and gave us a chance to eventually get the point and almost two. Another tough result in what’s been another testing season for Panthers fans. The Cats close out the 2018/19 season on Saturday night as they host the Devils at 7 pm. Since Feb. 17, Barkov (41 points) and Huberdeau (38) are No. 1 and No. 2, respectively, in the league in points. The Islanders, who on Saturday clinched their first playoff berth since 2016, have won just one postseason series since 1993. Against the Panthers in 2016. Panthers goalie Roberto Luongo was given the night off on his 40th birthday. Happy birthday Lu! 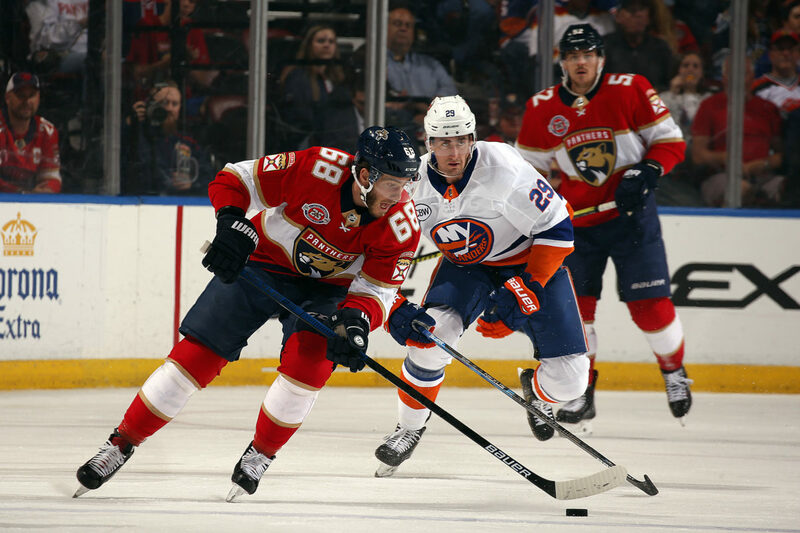 With one game left in the Panthers season, will Barkov break the franchise record for points? He has 94 points, tied with Pavel Bure’s record set in 1999-2000. New Miami Dolphins Head Coach Brian Flores dropped the ceremonial first puck before the game.